The authorities have found a novel way to keep the city’s traders and shopkeepers on their toes and follow the ban on use of plastic bags: keep the exact line of punishment wrapped in suspense. The Delhi government’s advertisements under the Environment Protection Act have so far emphasised only on the maximum penalty — Rs 1 lakh, and/or up to five years in jail — for any shopkeeper caught using plastic carry-bags. While not all shopkeepers found handing out a plastic bag, or a customer found carrying one, would get the maximum penalty, the government has so far kept quiet on the penalty amounts for varying degrees of violation. The Delhi Pollution Control Committee, meanwhile, carried out its first checks last week to enforce the ban. The committee’s teams inspected the row of state emporiums on Baba Khadak Singh Marg in Connaught Place, and the Shalimar Bagh market. The findings, officials said, were cheerful: most traders are keeping off the polythene bags. 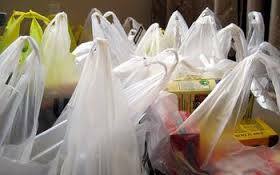 “We found that the emporiums were not stocking plastic bags,” Environment Secretary J K Dadoo said. “Some violators in Shalimar Bagh market were let off with a warning as they promised to abide by the law.” The violations, he added though, were “small-scale”. Under the notification issued by the government, even customers found using plastic bags may be punished. “We are not ruling out penalising a consumer carrying a plastic bag,” Dadoo said.